The victims include a father, mother and a four-year-old son with his aunt from one family, and three others from another family. Meanwhile, another civilian gunned down by the SLA in Musaali division on Saturday was also brought to Mannar hospital and identified by relatives, according to medical sources. 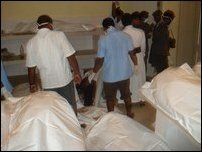 The bodies of the DPU Claymore victims were brought to Mannaar District hospital by the Sri Lanka Red Cross (SLRC) and ICRC officials in five vehicles Sunday evening at 6:15 p.m.
Mannar Bishop Rt. Rev. Rayappu Joseph was present at the hospital mortuary where hundreds of relatives of the victims were present to identify the dead. 24-year-old Selvakumar, the driver of the vehicle, his wife Princy Selvakumar, 25, their 4-year-old son Rehushan Selvakumar and the boy's aunt Jesudasan Elizabeth, 42, were identified as four members of a family in front of Mannaar District Magistrate T.J. Prabakaran. Panimayam Jeyaraj, 50 his son Panimayam Oscar, 20 and 19-year-old girl, a close relative of Mr. Jeyaraj belong to another family of the civilian victims. Three others killed in the DPU attack were identified as 4-year-old girl Puvisuvetha, 25-year-old male Krishnapalan from Vavuniya, and 60-year-old woman Saroja Nagamuththu. The relatives had to identify the dead using their cloths and belongings as their bodies were in highly decomposed state. The bodies are to be handed over to the relatives for immediate burial, medical sources said. Meanwhile, another body of a civilian gunned down by the SLA on Saturday was brought to Mannaar hospital Sunday. 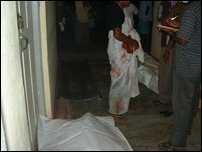 The victim was identified as Pulendran and his body was handed over to his relatives for burial.